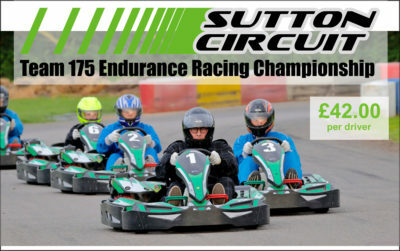 If you are thinking of getting involved in kart racing, or looking at a way to get started in kart racing and want to do it on a budget then take a look at our Sutton Circuit Rental Kart Racing Championships. This is a great fixed cost way to get involved in the highly addictive, adrenaline-fuelled world of kart racing without the expense of buying, running and transporting your own kart, and without the need for additional race licensing etc. At Sutton Circuit our fleet of rental karts are maintained to make sure they are totally equal in performance, which means our racing championships are all about the drivers, equal machinery gives way to exciting, exhilarating and close racing which is fantastic to watch and even better to take part in, we currently run two championships at Sutton Circuit. 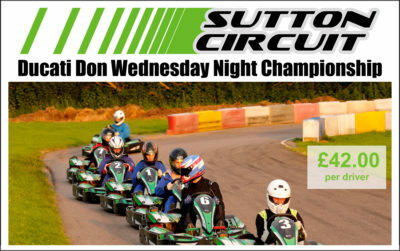 The Wednesday Night Championship is a sprint racing championship, fast and furious heat based racing. If you prefer endurance and team events then Team 175 is perfect for you, each team of two drivers is matched to bring them as close as possible to 175kg for both drivers making the racing uber close and hyper-competitive.